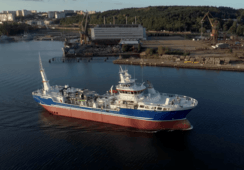 Gisle André Enstad is pleased with how the fish are growing in the Engesund cage. Photo: Pål Mugaas Jensen / Kyst.no. Fish placed in an experimental closed concrete cage in a Norwegian fjord are growing better than expected and mortality is low. 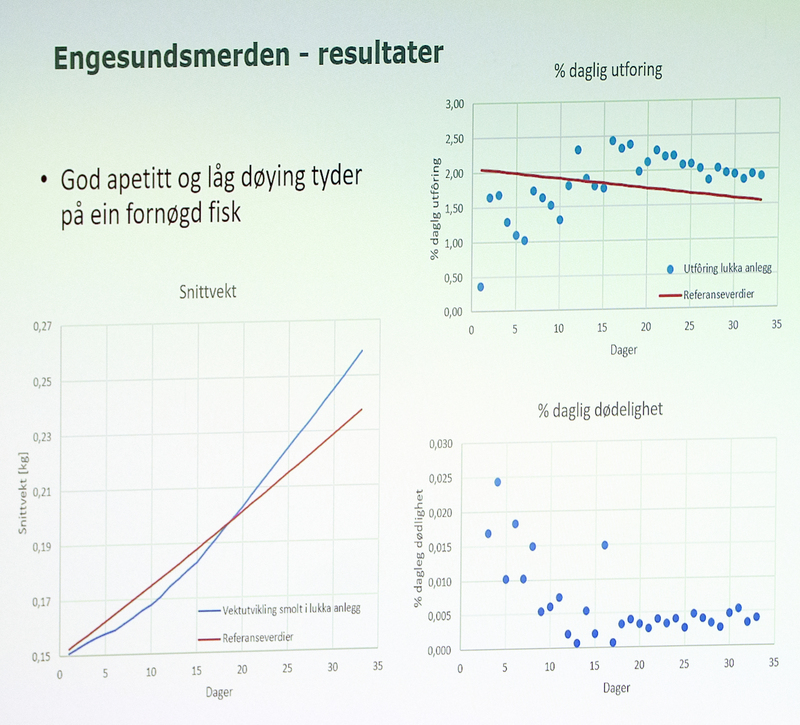 Gisle André Enstad, R&D manager at Engesund Fish Farming, gave the update at this week’s Tekmar salmon farming conference in Trondheim. 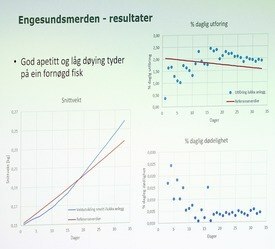 Engesund placed 150,000 fish of 160 grams in the 1,000m³ cage in October. The intention is to grow them to 400g then transfer them to net pens. Clockwise from bottom left: growth, feeding and mortality after 35 days in the Engesund cage. Click to enlarge. Source: Engesund. 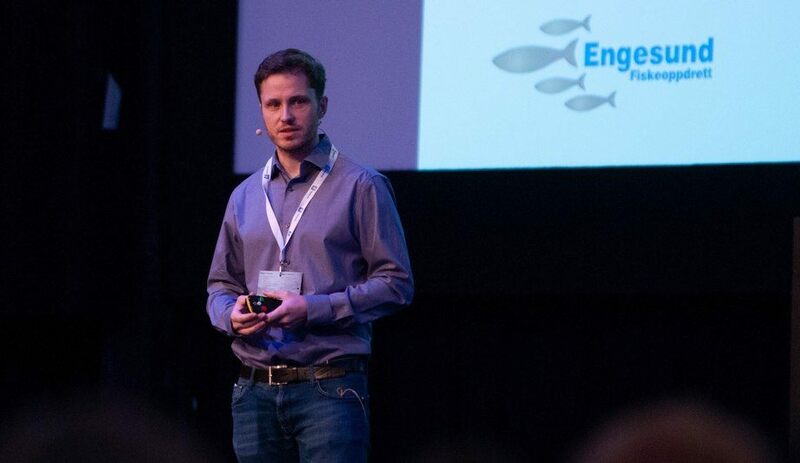 Presenting data on the first five weeks of the fish in the cage, Enstad said they were a little below reference values for growth in the first fortnight but were now performing better than average. “Growth is better than expected,” he said. Mortality in the cage is also low, generally less than 0.005% daily. 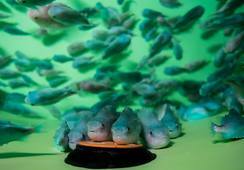 “Good appetite and low mortality suggests a satisfied fish,” said Enstad. Engesund has also received analysis of mucous membranes from mucosal mapping company Quantidoc. 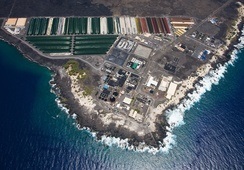 “The results from this show a very good health status on the fish,” said Enstad. The concept is taken from Backe Bergen (now Bergen Group Sjøsterk) concrete feed barges. The first cage is 1,000m³. 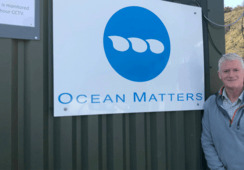 The cage/barge is funded by Innovation Norway and the European Investment Fund. The rectangular-shaped cage is built as a flow-through system. The water is collected from a depth of 20 metres and filtered to remove everything from jellyfish to lice larvae. The water is pumped in at one end wall and is emptied at the other. Some of the water is oxygenated and recirculated, while the rest is discharged at a depth of 5 metres. The pump capacity is 1500 m³ / h.
A cleaning robot is used very evening to extract most of the sludge after final feeding. 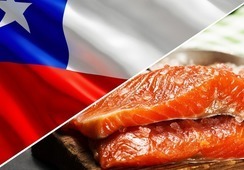 The energy consumption is estimated at about 1.35 kWh per kg of fish.